One of the greatest mysteries of the Anglican faith has finally been revealed. The question of how vicars communicate with each other over distance has puzzled ecclesiastical scholars for centuries. 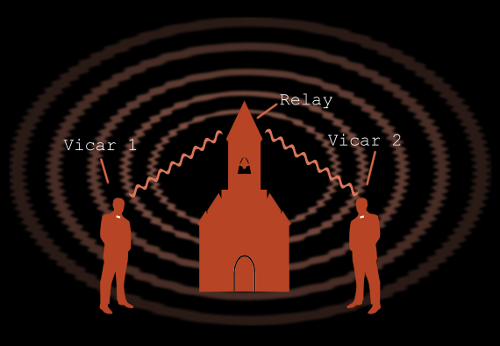 For a while it was thought to be a variation of nun semaphore but now the Church of England has finally answered the question by explaining that it is essentially a form of shortwave prayer. Whether you believe that prayer gives us a hotline to The Almighty is very much a matter of faith, but it's a fact that vicars have been using it to converse with one another since the reformation. They claim that it's more reliable than modern phone networks, more convenient and the data roaming charges are much more reasonable. The exact mechanics of the technique have yet to be fully explained but it's understood that before he or she is ordained a trainee vicar will undergo an intensive course of instruction in vicar-to-vicar prayer. By the time they assume their parish duties, each is able to communicate almost instantaneously with vicars anywhere in the world. Some archdeacons can also send images and most bishops support video conferencing. So far inter-denominational prayer has not been possible, meaning that if a Church of England Vicar wanted to communicate with a Roman Catholic priest, he'd probably have to resort to email. But the introduction of new digital vicars and the gradual phasing out of old analogue models means that this could soon change. There are also plans to turn the Archbishop of Canterbury into a Hub so that anyone within his immediate vicinity will also be able to use the network, as long as they know the security prayer. Firstlode the vicry kneelys in the churchy polpit, with the vestlodes all arrayed splendiciously, and offlys up the prayer unto the magesticaly firmament, most celebraty, deep joy. Through the wonderol powwow of the gangly spiral the humbly wordals are transpoddled over the ether, all speedymost, and received in gladiole through the thrips streepy. Remarkabold, truly remarkabold!